A wired backup camera system is the best way to get the perfect picture first time and every time. Tadibrothers sells wired backup camera system with the Cable lengths ranging from 18 feet all the way to 100 feet. We are industry leaders in multi camera systems as well as single camera systems. The best time to install a wired backup camera system is while you having you RV built, however we know that is usually not the case for that reason we provide you with a very easy to follow instructions and diagrams. If you have an old style RV system, such as furrion, voyager, weldex, etc.. we have adapters to make your monitor and camera work through the existing cable. Whichever system you end up choosing, keep in mind that ALL of our backup camera systems can double as observation cameras which means they can stay active while you're driving down the road or changing lanes. 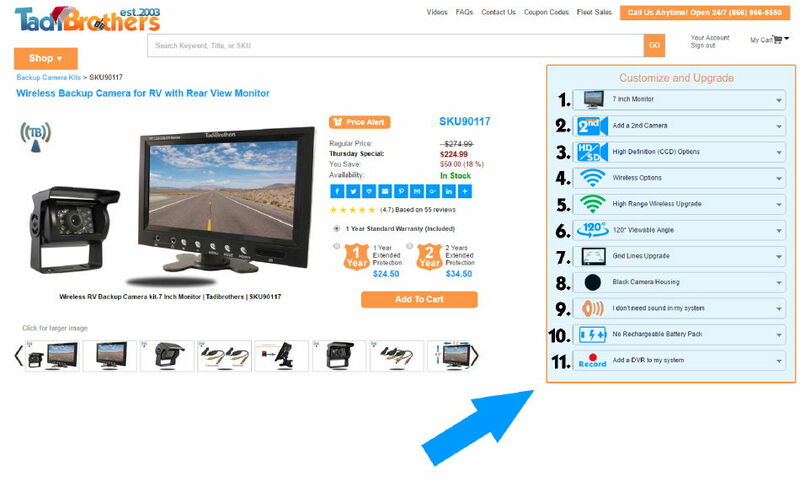 To find better find a system that fits your needs, use the filters on the left of the page to narrow your results, once you find the item you like, use our “CUSTOMIZE AND UPGRADE” section at the top right of that page to configure the system to your needs. 1. Standard backup camera system (SKU25032) - this entry level harness is very light and easy to set, it’s good for the standard quality camera (CMOS) and is 100% weather proof. 2. Heavy duty backup camera (SKU25033)- This harness is more durable than the standard and for that reason is a little heavier but it also has connection clasps that our customer find it easier to connect and reconnect at the hitch. 3. Industrial backup camera (SKU25034)- this is our luxury edition it is lighter than the Heavy but it has hi-definition cabling that will give you a video image worthy of TV. All the connectors have a comfortable rubber coating and make hitching up very fast. This harness is a bit more expensive but well worth the upgrade, it's also the most durable we sell and it’s the only cable we sell to fleets. By using the “CUSTOMIZE AND UPGRADE”at the top right of the page, you can choose which hitching harness is best for you. In addition, you can also change, upgrade or add cameras to your system by using that section. In most installations, our premium cable for backup cameras have are the best quality in the industry they are gold tipped weatherproof and you can even upgrade them to carry the 12 V power from the front of the vehicle to the back. The "power upgrade" is a great solution for those who want to power the entire system from one source. Whether you are using our quick disconnects or our premium cables all of our connections are 100% weatherproof, the cables just like our wired backup camera systems, in general, are built to last.